The present Manila Cathedral rose phoenix-like from the desolate ruins of the old cathedral, which was bombed mercilessly along with the rest of the Walled City during the Battle of Liberation in 1945. Asserting back its distinction and dignity as Manila’s premier temple and metropolitan seat of the Archdiocese, the present structure emerged in the midst of the pathetic remnants of Intramuros, its open spaces colonized by squatters and its ancient ruins converted into cargo warehouses. For many years after the war, the shell of the Manila Cathedral stood before the gaze of the statue of Carlos IV in Plaza Roma. The ruins of its famous façade remained. There was the rose window without the colored glass and the three portals with their receding arches and the cathedral’s historical marker. Manila’s clergy had thought of transferring the cathedral from its site in Intramuros. In fact, Archbishop Michael J. O’Doherty and Archbishop Gabriel Reyes pondered on the idea of transferring it to Mandaluyong. It was only through the efforts of Archbishop Rufino Santos that the cathedral was able to reign again in its rightful seat. Fortunately, the cathedral ruins were left to stand in place, still untouched by the bulldozers that leveled off most of the ruins of Intramuros. Santiago Picornell, a well-meaning Manila resident who thought of the historic significance of the ruins, talked out the American officer in charge with the clearing of Intramuros from bulldozing the few bits of history that were left of the cathedral. And from these final surviving fragments of once a majestic edifice, famous architect Fernando Ocampo spun a resemblance of the old cathedral’s design carried over to a new one that was to rise from the same ground, from the fresh wound of history in the heart of the Walled City. Ocampo, though, deliberately avoided duplicating inch by inch the previous design and instead came up with a new and modern cathedral with an appearance similar to its predecessor but with a more functional use of space. Ocampo’s cathedral was made more spatially and visually interesting by its striking Neo-Romanesque façade, Byzantine motifs, bronze doors, pineapple finials, and many other artistic ornamentations. It has a particularly eclectic character, brought about by the mixture of revival, renaissance, and modern styles with a dominantly Marian theme as a tribute to the Immaculate Conception, the cathedral’s titular patroness. The Manila Cathedral covers an area of almost 3,000 square meters. The present structure has a Latin-cross plan which closely follows the distribution of spaces of the previous cathedral-aisles are separated from the nave by arcaded colonnades, and several chapels flank the nave. The beauty and wonder of marble as a building material stand out in the Manila Cathedral. The chapels are paved by highly polished Carrara marble prefabricated in Italy. The main altar, which has a two-meter high statue of the Immaculae Conception, is featured with lovely columns built out of green Carrara marble. Paving the rest of the cathedral floor are cream slabs of marble. Marble also found its way in the altars of the side chapels where reliefs and mosaic panels add further decorative accents. Likewise, the pulpit and the Episcopal throne are made out of Italian marble. Although fashioned after the previous structure, Ocampo’s cathedral is the product of his own creativity and talent, the child of his sensitive appreciation and respect for the older cathedral structure, the design and plan of which he adapted to the postwar period’s modernist trend in architecture. Indeed, the present Manila Cathedral is the product of its own age and time. The Manila Metropolitan Cathedral was solemnly consecrated on December 7, 1958 before the Feast of the Immaculate Conception, a tribute to Our Lady under whose guidance and patronage the Cathedral of Manila was able to reign as queen of the Walled City, refuge of Manila’s denizens, and symbolic seat of the Catholic Church in Manila. Rufino J. Santos was the Philippines’ first Cardinal. He was given a rousing, unprecedented welcome in the Manila Cathedral where his coat of arms is perpetually emblazoned. During his term as Archbishop of the Archdiocese of Manila, there was a flurry of building activities in the archdiocese such as the construction of San Carlos Seminary, Our Lady of Guadalupe Minor Seminary, Pius XII Catholic Center, Catholic Charities, St. Paul’s Hospital, etc. When Cardinal Santos died in 1974, the Manila Cathedral became the site of his funeral wake. Thousands flocked the cathedral to pay their last tribute to the first Filipino Prince of the Church as he lay there for two weeks. He was buried in the grand subterranean crypt of this church, together with his predecessors: Archbishop Michael J. O’Doherty and Archbishop Gabriel Reyes, the first Filipino Archbishop of Manila. In the 1970s, the most memorable event that brought thousands upon thousands to the mother church of the country was perhaps the visit to the Philippines of Pope Paul VI in November 1970. A marker at the base of the main altar commemorates his pastoral visit in the presence of the ancient venerated image of Nuestra Señora de Guia. Three years later, the entire Philippines rose as one to welcome the third Filipino Prince of the Church. Archbishop Sin was the youngest Cardinal in the world, and the cathedral was again host to his reception. His youth and energy were called upon to rehabilitate the St. Paul’s Hospital and the Cardinal Santos Memorial Hospital, which then boasted of expert medical staff and hospital equipment second to none. The St. Joseph the Worker Foundation, Radio Veritas, and various charitable institutions were also to receive much-needed shots in the arm. 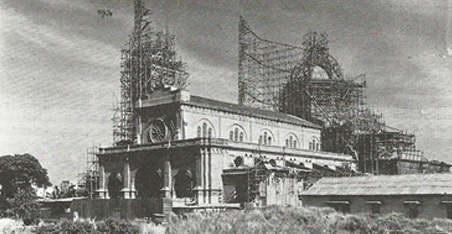 With the radical overhauls and improvements undertaken in the latter part of the 1970s, the Manila Cathedral was not caught unaware when a series of important national and international events took place in its hallowed confines. 1979 was the Quadricentennial Year of the Archdiocese, since its creation as a diocese suffragan to Acapulco, Mexico. Jaime Cardinal Sin made the year more memorable by convoking the Fourth Synod of Manila in October. It was marked with grave concern for community affairs and social justice and with the regulation of the liturgy and of the lifestyle of the clergy. Following the Fourth Synod was the International Mission Congress presided over by Angelo Cardinal Rossi during the opening ceremonies at the cathedral. Then, on December 7, the National Eucharistic Day was celebrated. Finally, the International Law Association, which held its conference in Manila also in December, saw it fit to close its deliberations with a Mass at the cathedral under the auspices of the Catholic Lawyers’ Guild. Undoubtedly, one of the most significant religious events in the Philippine ecclesiastical history was the beatification of the first Filipino martyr Lorenzo Ruiz on the occasion of the visit of Pope John Paul II to the Philippines in February 1981. The much-loved Pope came amidst cheers of Totus Tuus from the crowd to celebrate his first Mass on Philippine soil at the Manila Metropolitan Cathedral. Shortly thereafter, he told Cardinal Sin that he wanted the cathedral to be a Basilica.